I bought them because I am a sucker for new vegan products, and they were nice, but I won't buy them again because I really could just make my own. In my kitchen is this box of puffed rye and barley with dried cherries. I always like the idea of puffed cereals more than the reality, and so it was here. However, this is nice mixed into yoghurt or combined with other cereals. In my kitchen were two decadent dessert pots by Freak's of Nature. They were as good as they sound and look! ...they are beautifully vibrant in colour and make good snack options for Mini Bite alongside the breadsticks she loves (as per above container). In my kitchen was a chicken-style sandwich with hummus and sweet chilli sauce. I made it using a vegan Quorn fillet, sliced after cooking and loved the final result. One of the downsides of our kitchen is that the fridge/freezer unit is housed within a cupboard. I hate the thought of being tied to the existing space if we ever have to replace it, and it means we have no fridge surface on which to display notes, postcards or magnets. The few magnets we have live on the side of our microwave, but I recently thought to move a few baby friendly ones to the front of the dishwasher. Mini Bite loves taking them off and moving them around, so it is an excellent new strategy for keeping her entertained while I'm cooking. Last but not least, in my kitchen (well, dining room) are a bunch of flowers from Mr Bite. Somehow, we have now been married for 5 years. 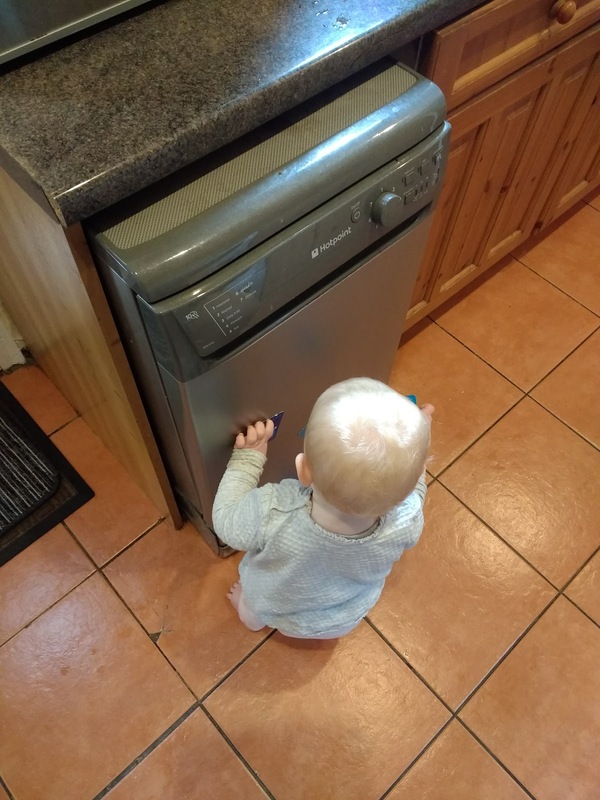 I like your thinking outside the box with the magnets - great fun for Mini bite. The pots look good but the crackers really are my sort of thing - I have a crackers fascination lately. And beautiful flowers - congrats! Thanks Johanna :-) I still think Australia does crackers better than England but these are good finds. Happy Wedding Anniversary, the blooms are lovely. And yes magnets as a distraction for Mini Bite are a super idea to keep her distracted. I have had the traditional chai latte powder in the past but pleased for you that you have found a vegan alternative. I am liking you Crackers mostly, where did you get them? as I've not seen them before. I found the crackers in Waitrose :-) Always dangerous for me to go in there but they do have some different products. These were in their 'free from' section. Thanks as always for hosting Sherry! 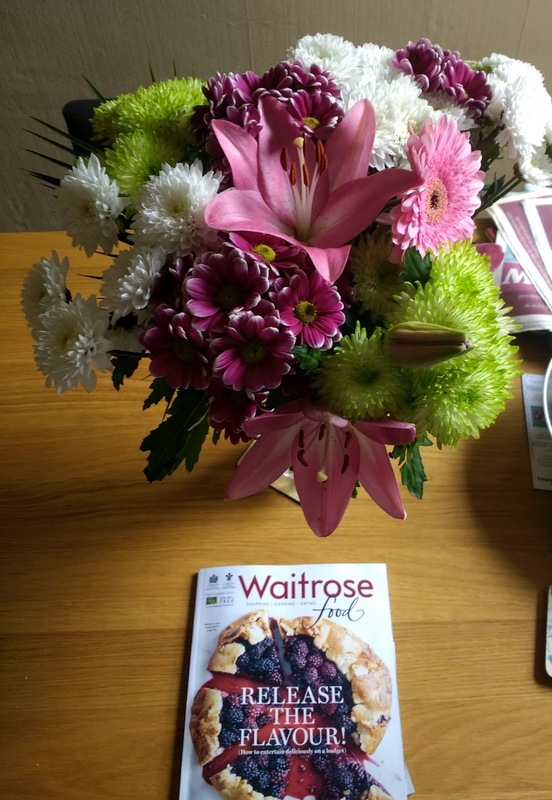 Happy 5 year anniversary - what a lovely bunch of flowers. Gorgeous colours - much like those crackers! I keep seeing the Freaks of Nature pots and thinking I should pick some up - now I know how good they are, I'll be making a beeline for them. Congrats on 5 years married! I like the sound of the puffed rye. I'm also celebrating a 5 year anniversary but this is how long I've worked for SARMs Australia and it's also been like a marriage in some ways LOL!